Is RGB lighting and high-res audio enough to make this king Khan? If you can live with the budget finish, your reward is shockingly good sound for a meager financial outlay. Can you hear the difference? That’s the million dollar question when it comes to this new model in Roccat’s RGB-lit range. Boasting 7.1 high-resolution audio support, it can articulate surround sound and sparkling lossless audio at the same time. And, inevitably, it does all that while emitting colored lighting of your choice after loading up Roccat’s Swarm software and programming in a set of hues that speak to you. Figuratively, of course; the AIMO lighting system is intelligent enough to synchronize with other compatible peripherals—Roccat’s AIMO keyboard and mouse—but it stops short of actually giving those colors their own voices. In many ways, high-res audio is a natural bedfellow with PC gaming’s other obsessions: frame rate, refresh rate, and image resolution. It’s an inexorably bound aspect of the hobby, to strive for the absolute best, whether it has any tangible benefit on your experience or not. In that sense alone, the Khan AIMO’s audio chops are a selling point. But let’s be real about this: Can you hear the difference? In order to really exploit the benefits of this headset, or any other that supports high-res audio, you need a high-res audio source. Tidal and similar music streaming services offer lossless playback, at a price, so if you’re already sufficiently into the idea of hearing Lindsey Buckingham drop his pick and Stevie Nicks clear her throat somewhere in the mix of Fleetwood Mac’s Rumours, well, these are the cans to listen to it on. What about games, though? Bethesda’s recent Wolfenstein II: The New Colossus boasted high-res audio, itself a slightly woolly term that refers to anything above CD-quality 44.1KHz sample rate, and usually double that. But what else? Anyone? Bueller? 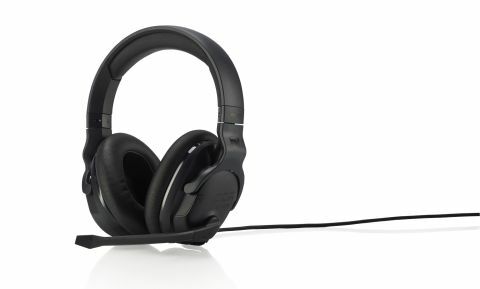 The chances are the vast majority of games you play with this gaming headset won’t make full use of its capabilities. That would be a problem, ordinarily. But it isn’t. Not in this case, because the difference between CD quality and high-res is actually quite subtle, to our ears, and Roccat has priced the Khan AIMO low enough that it really doesn’t feel as though you’re paying a premium for the privilege of high-res sound. We’ve probably got Kingston’s HyperX Cloud series to thank for keeping the sub-$150 headset market so competitive, and it's here that the Khan AIMO fits in among its competitors—the majority of which don’t offer this same smorgasbord of features. Trying to decide on the right cans for your ears? Let us help: check out our guide to the best gaming headsets. There’s another reason why it shouldn’t matter to you that most of what you hear through these cans isn’t high-res audio. As a by-product of its construction to meet these specs, the Khan AIMO cans sound great whatever you run through them. Its frequency response range, 10Hz right up to 40KHz, runs well above the standard 20Hz-20KHz most headsets strive for, because it needs all that extra headroom to properly articulate the high-res audio sources when they do come along. So, in the best possible sense, it’s overqualified for most tasks you put it through. Like having Bill Nye packing your groceries at the convenience store. Tuned to a pleasingly flat EQ balance, and able to pick out the finer details of even standard quality audio, these are seriously impressive headphones for the money. But it’s evident where compromises have been made to hit this price point. You’re never going to pick these up and mistake them for a pair of Bose QC35s: In the absence of costly Alcantara suede and memory foam dressed in soft faux-leather, there’s a so-so pair of earpads that become quite hot before too long, and a headband that could use more cushioning or less weight. While we’re on the negatives, the volume control is too small and stiff for our liking, too. Points are won for the auto-mic mute when you push its bendy swing-arm up, but there’s no getting round the Khan AIMO’s budget finish. If you can live with that (and the vast majority will be able to), your reward is shockingly good sound for a meager financial outlay.